We're not the only one's loving all the US/UK music collaborations going on right now. B.o.B has been talking to MTV News UK about the growing number of British artists making their mark in America. He says it's a chance for international artists to make their voices heard on a wider scale. The rapper, who teamed up with Jesse J on her hit track 'Price Tag', says he's open to another UK collaboration as long as it's an organic process. While the afrobeat genre has been growing steadily in the UK and D'Banj himself is a huge star across Africa it'll be interesting to see how American audiences take to the fast-paced, rhythmic basslines and African expressions. If nothing else let's hope the collaboration helps to strengthen relations between Africans both in the US and abroad. After deciding he's picked on the American's enough, documentary-maker Morgan Spurlock is headed to the UK to ridicule them a little. The 'Super Size Me' director's new show 'Morgan Spurlock’s New Britannia', launched on the Sky Atlantic channel in the UK on Monday. It's a humourous look at British culture through the eyes of an American. Spurlock said he wanted to find the real Britain and his adventures take him from a real-life Superhero on patrol to making Black Pudding in a Bury factory. It's an interesting idea but wouldn't it make more sense for the series to air on American TV and give those who've never set foot in Britain an insight into what the country is really like? After trying the US for a while ex-Spice girl star Mel B has moved to Australia and likes it so much she reportedly wants to become an Aussie citizen. The singer spent much of the last year jetting between the UK, LA and Australia as a judge on the Australian 'XFactor' before landing a hosting gig on the country's version of 'Dancing With The Stars'. She's now set up shop there with her husband Steven and three kids and says she's happy and settled. I suspect that's the same thing she said when she moved to LA. 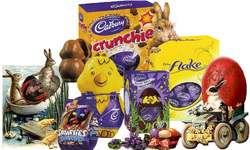 We're not sure about you but celebrations like Christmas and Easter always make us feel a little homesick. Not so much for the occasion but the food we're missing! There's nothing like some good old roasted spuds on Christmas day or a traditional fish dish and warm hot cross buns on Good Friday. And it seems that traditional English dishes are becoming more hip these days at a selection of restaurants across America. New York's 'Spotted Pig' and the 'Whip Tavern' in Pennsylvania are both serving Easter brunches while you can find proper Easter eggs (the large chocolate ones, filled with smaller treats) at 'A Taste of Britain' in Pennsylvania. Photos used under Creative Commons from www.chicagofabulousblog.com, jurvetson, .Martin.